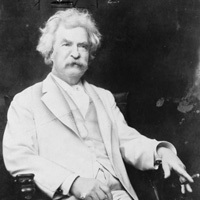 I started to think about Mark Twain this week, how I am at the same age when he began writing some of his most biting satire about politics, religious hypocrisy, bigotry and the nature of people. Whatever he was as a critic of Government, he always believed in supporting the nation and his writing made people think. While I still see the fundamental good in people and role of a loving God to help change flawed humanity, I am sorely disappointed by and feel a powerless spectator to, the downward spiral caused by politics and politicians. What can a journalist do? A Senator chastised schoolchildren visiting the Congress who urged her to support legislation proposed by a ‘socialist’ Freshman Congressman and one of her colleagues. It could have been a moment to explain that legislation needs to be carefully studied as to the impact on the governed. But she would not be dictated to. In prior years, letters I sent her as a constituent in the Senator’s district, specifically urging support for issues she opposes, generated form-letter responses. A one-time Political Science graduate, I am angry that important issues are not often acted upon by our elected representatives. Increasingly, actions are opposed ideologically, becoming a test of wills between Legislature members and the Executive Branch. While many support “Progressive”national politics and condemn “capitalists” or “conservatives”, there are no substantive debates of the merits and the failings of policies, but often incoherent and confusing ‘sound bites’. Government agencies specifically charged with protecting the safety and sanctity of the nation’s citizens respond instead to political power brokers, lobbyists and vocal opponents of the nation’s fundamental principles. Elected representatives and un-elected bureaucrats refuse to operate on Constitutional and nationally-unifying principles, but at other times defend their positions using the same principles they previously refuted. Most unsettling, is that some politicians will use the formerly apolitical agencies of Government to investigate opponents or enhance political agendas, and when opposed, conclude that the victorious majority must either be “deplorable” and bigoted, clinging to outmoded ideas and philosophies, or have colluded with extra-national agents. Public education over fifty years has steadily replaced literature, debate, and ‘controversial’, i.e. unpopular, topics like physical education, wood shop, and trades-based career preparation, for gender and sexual identity accommodation, activism, and uniformity. Children who are raised to question classroom stances on topics that contravene their parents beliefs (prayer, football, ‘binary’ genders, or other ‘conservative’-supported subjects) are subject to administrative penalties and peer abuse. Colleges, once institutions that provided the foundations for an educated population in everything from arts to zoology, produce impoverished liberal service-industry workers with billions of dollars in student loan-indebtedness. But teachers, professors, and college coaches have wealth and comfort regardless of student success. Local and state government may demand revenue (taxes and ‘fees’) for actions that do not materially benefits those taxed. Transportation projects that incur billions in wasted dollars for “trains to nowhere”. Bureaucrats demand ‘carbon credits’ exchanged those who use personal transportation to go to work. They charge higher fees for delivering power and water to residents, due at first to ‘climate change’ which others perceive historically as periodic drought. But then the government raises fees when residents conserve too much. In the intervening years, there are no projects to collect additional water or energy. Courts rule against voter-supported legislation that a minority oppose. Or they issue injunctions that increase the cost and delivery time of a particular resource for years. Politicians and bureaucrats deliberately obstruct law enforcement officers, both state and federal, when executing their duties. Others release dangerous criminals into the community based on alleged racial bias at sentencing, only to have them offend and be re-incarcerated. What, if anything, can journalists do to help expose the failures of politics and Government? Ideally, journalists are the agents of the governed, investigating and exposing fraud, incompetence, and abuse of power. Journalists must elevate their craft, to withhold biases and favoritism toward a politician, an ideology, or ‘sacred’ conclusions, and report everything that may support or refute the subject. Of course, the twenty-four hour media business is a profit-driven business, and ego, power, and prestige are just as driving influences for journalists as is determining fact from fiction. When actors create false scenarios, or others rush to attack (like the MAGA hat student and the native American) that became widespread calls for violence and condemnation, the lack of proper investigation fortunately only resulted in embarrassment and lack of journalistic credibility. It may still result in a civil judgement in favor of a maligned victim. Journalism as the vanguard of the public suffer a loss of integrity in reaching conclusions before investigating the facts. Politics, power struggles, and scandal, not necessarily altruism, common ground and ethics, fuel Progressive versus Conservative debate in America and elsewhere. In this article published by CNN in the month prior to the sexual misconduct allegation in his high school years, brought against Judge Kavanaugh, the article provides insight into his stance on prosecuting misconduct by a President. It may be more of an indictment of his critics, whose aggressive opposition of a sitting President’s exercise of his office, is far more bellicose and histrionic than prior Administrations’ critics. It may well be that the critics are concerned that a more strict Constitutional-focused Supreme Court Justice, may rule for example, such that the Executive Branch has the Constitutional authority to set immigration policy, or that the Court rules on cases based on established law and Constitutional basis, not by public opinion or lobbyists. For those opposed to an elected member of Congress or the President, the ballot box is appropriate venue for voicing a citizen’s disapproval. Another blogger I follow published a story of a workman in a farming community who ignorantly, but purposely, set a blaze to burn cut brush in very dry conditions. It was a day with a light breeze. And it was next to fields that provide this blogger’s animals’ feed. Another quick-reacting farmer cut a fire-break that minimized the destruction that would have been – to the surrounding fields and forest. My wife recounted by phone to me mid-day a terrifying encounter on a highway with a fool speeding behind her by inches, screaming, throwing the “finger” around, and swerving around and slamming on brakes. Worse still, he was taking pictures of her with a cell phone. A maniac on a mission to kill himself or others. She was shaken but unscathed. And her passenger, returning from a cardiac treatment, safe as well. And the often-maligned law enforcement officers were not present to intercept “road rage”. A train operator in a large metropolitan center on the U.S. East Coast was distractedly using a cellphone while a train was traveling through an area too rapidly to navigate a turn. Of course it crashed. Because the automated speed-control feature of the track had not been installed at that time. In the IOT (Internet of Things), we are not yet at the future our futurist movies depict. But then fallible humans design them. A Navy ship with a highly-advanced navigation console, but relatively unfamiliar operators and overly confident command authority, collided with a commercial ship. It resulted in death, destruction, and ruined lives and careers. This week, a social media post by a popular American television star, blatantly and undeniably abhorrent, resulted in firing and the show’s cancellation. A fool’s big mouth resulted in lost jobs for all those behind the scenes. People are often responsible – or irresponsible – for many problems that beset us. Many times, of course, the things that plague mankind including influenza or wildfires, earthquakes or volcanoes are beyond human control. But then, building a community on an active earthquake fault or on an island (Hawaii) created by an active volcano is by human design. These behaviors and consequences are reasons to find comfort and instruction in the Proverbs of the Bible, wisdom of the ancient Greek philosophers, or other contemplative authors. Human behavior has been the same for thousands of years. Only the technology has changed. In the past week, the tabloids and other media was agog over the Royal Wedding of Prince Harry of Britain. The Duke of Sussex, KCVO (Knight Commander of the Royal Victorian Order ). Several of my friends on social media posted “enough already”- type memes and commentary. I probably have a unique viewpoint among them, in that a “Combat Veteran Gets Lots of Love by the Media”. Unique among the current British Royal family, Prince Harry served in combat, in Afghanistan, not just in uniform. His presence was kept secret for several weeks by the British press. In typical fashion, some in the media cannot keep secrets. The Australian press revealed that the Prince was in Helmond province. Against the Taliban and Al Quaeda, publishing the whereabouts of a high-value target such as the Prince was unwise, yet the prince continued to serve in theater. After serving in the British Army for ten years, he has continued to serve in a leading way but for charitable work. Unintentionally, I believe, the news media has made a combat veteran a star. For a guy with army service, and little chance of ever becoming King ( he’s fifth in line behind his elder brother and family), I think it is pretty cool. Serving honorably in the U.S. military, a veteran who was deported to Mexico, Hector Barajas, gets well-deserved news: U.S. citizenship. ( https://www.nbcsandiego.com/on-air/as-seen-on/Deported-Army-Vet-Granted-U_S_-Citizenship_San-Diego-478353393.html ) And he did not just while away his time in Mexico, but served fellow deported U.S. military veterans – opening a Tijuana VA Clinic. With all the nonsense about non-citizens demanding rights and privileges of citizens, as well as their supportive legislators and lobbyists who brazenly chastise this country and citizens, it seems that justice is finally at hand for someone who put skin in the game. Barajas -Verela had been brought to the US when he was seven. In 1995, he enlisted in the Army and served in the 82nd Airborne. He had an incident with a firearm in 2002, resulting a year in prison and was deported. After Afghanistan and Iraq wars, the United States has seen more veterans with substance abuse, civil and criminal issues. A deportation should not have been punishment for an honorably discharged veteran. After California Governor Brown, pardoned him last year, it enabled Barajas to obtain citizenship. In 1862, a law granted expedited naturalization to foreigners serving in the U.S. military. If you were willing to die for America, you should be able to become a citizen was the rationale. Unfortunately, between 1875 and 1917, racism clothed in a quota system hindered the Asian-born from the same privileges. But the Spanish-American War brought change to that thinking. For most of the 20th Century, ending in 1992 with the end of an American military presence in the Philippines, Filipinos could enlist in the military. They would gain skills, have a successful career and earn a retirement. It was a path to citizenship due to a government immigration policy that serving during a conflict could enable naturalization. In 1990, an Executive Order by President H.W. Bush declared that any military member, Active Duty, Guardsman or Reservist could apply for citizenship without a residency requirement. And since July 3, 2002, President George Bush signed an Executive Order that all non-citizens serving since September 11, 2001 could immediately apply for citizenship. Its provisions included veterans of past wars and conflicts. But apparently, in 2009, the U.S. again amended the policy of enlistment and subsequent naturalization to only those who were in legal possession of a Green Card at the time of enlistment. It is a fairly complex issue when a state government refuses to follow Constitutionally-granted federal laws on immigration. Worse, for Deferred Action for Childhood Arrivals (DACA) legislation continued support or calls for repeal, persons affected are not just students at prestigious universities using scholarships, taxpayer support, and university grants, but also honorably-serving military member (s). Many of these foreign-born enlistees have skills, particularly in certain language dialects, and received entry by virtue of the Military Accessions Vital to National Interest (MAVNI) program. It is perhaps up to those of us who have served honorably in uniform, to let our elected officials -most of whom have not served in uniform – know that grandstanding about DACA, is not just about rebellious state officials, lobbyists with agendas, and one group of students using resources that are denied to legally-entitled students; this also affects our brothers and sisters in uniform. With all the televised nonsense about foreign flag-waving, non-citizen students, laborers, and tenured professors demanding rights and privileges, I will gladly support a foreign-born sailor, soldier, airman or marine who want to serve the nation he resides in, becoming a citizen before any of them.